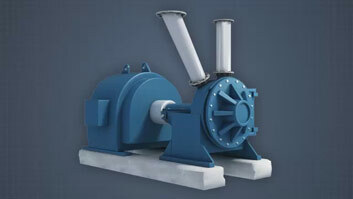 A pressure screen uses a screen basket and powered rotor to separate a low consistency pulp stream into the desired pulp, or accepts stream and an undesired debris, or rejects steam. Spinning rotors pass very close to the surface of the basket. As they move, they create a slightly positive pressure pulse which pushes fibers through the screen and a negative pressure pulse which back flushes the screen openings. When a screen basket becomes plugged, the differential pressure across the screen will increase significantly. 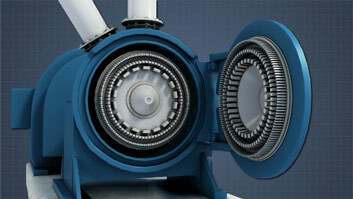 Closing the accepts flow to reduce the flow will often allow the rotor to clear the basket. Pressure screens are used primarily to separate unwanted debris or contaminants from the desirable fibers in papermaking pulp. This is accomplished by flowing a pulp slurry over a surface that has many small holes or slots in it. Most of the small flexible fibers pass through the openings, and are accepted, and the larger particles which cannot pass through the openings are held back, or rejected. 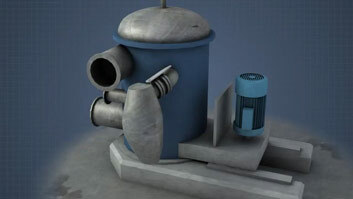 A typical pressure screen consists of a vertical cylindrical housing that contains a perforated cylindrical screen basket. Within the basket is a spinning rotor which supports foils or protrusions that run close to the surface of screen. Screen performance is quantified by looking at such factors as the reject rate, debris removal efficiency, and long fiber reject rate. What is the primary purpose of a pressure screen? 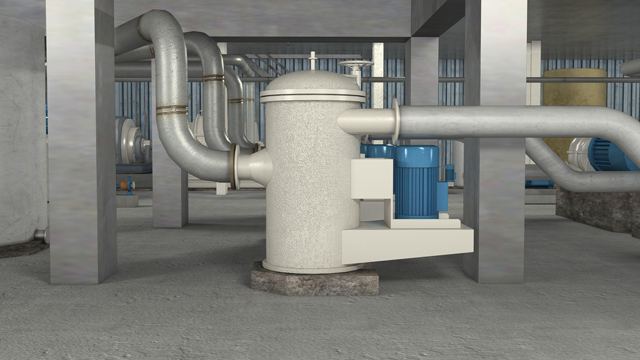 The purpose of a pressure screen is to separate unwanted debris from desirable fiber in a pulp stream. 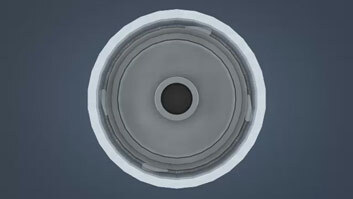 What is the purpose of the spinning rotor in a pressure screen? The purpose of the spinning rotor within the screen basket of a pressure screen is to keep the screen clean and increase the flow of fiber through the screen. What advantage is gained by using cascaded screens? No separation process is perfect. Some good fiber is rejected with the unwanted debris in a pressure screen. Rescreening the rejected fiber permits the recovery of the good fiber. Rescreening multiple times is referred to as "cascading" screens, and ensures a high fiber recovery rate. What is a good strategy for unplugging a pressure screen? 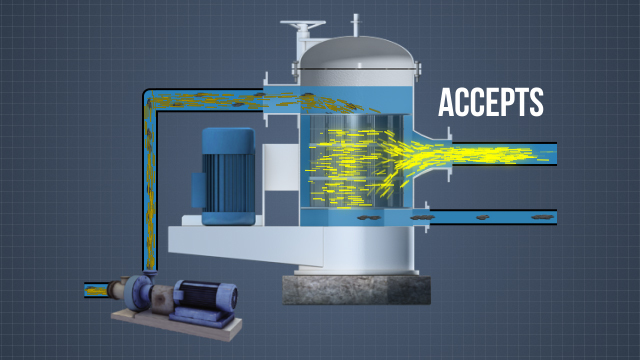 A plugged screen can often be unplugged by reducing or stopping the accepts flow, giving the basket an opportunity to clear itself through the rejects line, and re-opening the accepts valve. What could be some causes of poor accepts quality? There are many potential causes of poor accepts quality, but some of the more common possibilities are: low reject rate, a hole or gap in the screen basket, unusually high level of contaminants in the feed or worn slots or holes in the basket. 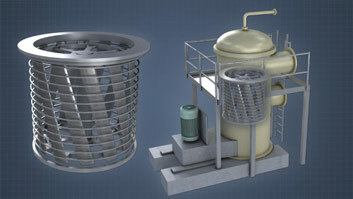 A typical pressure screen consists of a vertical cylindrical housing which contains a perforated cylindrical screen basket. 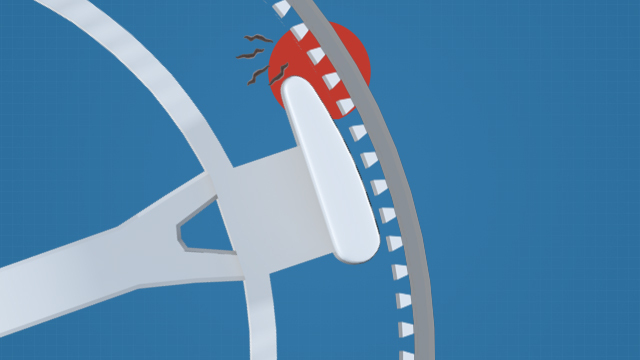 Within the basket is a spinning rotor which supports foils or shaped bumps that run close to the surface of screen. There are several variations on this design. Some screens are horizontal. Some designs have the inlet flow going to the inside of the basket, some have it going to the outside. One design employs two baskets with the flow being introduced between them. 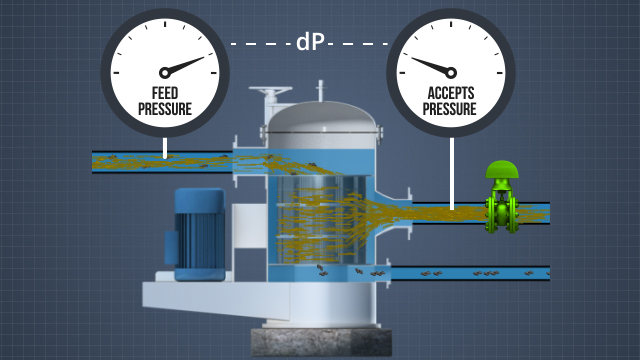 For simplicity, the rest of this module and the illustrations shown will refer to the “typical” screen described above with the feed flow going to the inside of a single basket.